Join us for a fun afternoon’s workshop learning Acro Yoga! Eugene Butcher will lead this workshop and weather depending, it will be held on the grass over looking South Fistral or in our studio with equally stunning views of the sea. 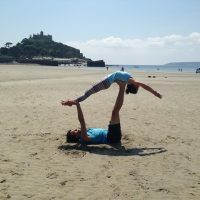 Eugene is an experienced yoga instructor and completed his training with Jason Nemer, co-founder of AcroYoga in the beautiful Om Shanti retreat just outside Barcelona. The afternoon will be fun filled and will involve lots of laughter. No partner is necessary as we split into groups of three and rotate between basing, flying and spotting. Don’t worry if you are new to yoga or acrobatics, no experience is needed at all. Eugene has a unique teaching style ensuring everyone has lots of fun and achieves things they probably thought were out of their realms! To book your place, please email stretch@oceanflowyoga.co.uk or call 07795 385308. You can either pay by dropping cash or a cheque into the studio or online using the following details: Lloyds Bank, Tom and Jen Harvey, 11362268, 30-90-34 using your name as a reference.